The Mazda L3-VE engine is a member of the Mazda’s L-series. It is 2.3-liter inline 4-cylinder gasoline engine that produced from 2001 to 2010. The L3-VE is also called as MZR engine. The engine is based on smaller 2.0-liter version – the LF-DE engine. The L3-VE engine has an aluminum alloy cylinder block with cast-iron cylinder sleeves cast directly into the engine block. The 2.3-liter engine shares the bore size with the LF-DE while the stroke was increased by 10.9 mm up to 94.0 mm (3.70 in). There is a two-piece housing with two balancing shafts inside at the bottom of the block. It is a cassette type balancer unit driven by a gear attached to the crankshaft that rotated at twice the speed of the crankshaft to offset the secondary inertia force. The engine has an iron crankshaft with eight counterweights and a torsional damper, sinter-forged connecting rods, aluminum pistons with graphite-coated skirts. The cylinder heads are also made of aluminum-silicon alloy. There are two double overhead camshafts and four valves per cylinder. The intake and exhaust camshafts are driven by the timing chain. The chain is maintenance-free and equipped with the chain tensioner which operated automatically using an oil pressure of the engine. The intake and exhaust valves have the angle of 39 degrees. They are actuated by solid bucket tappets (periodical adjustment is required). The valvetrain was equipped with Mazda’s variable valve timing - ‘Sequential Valve Timing’ (S-VT) system. The intake system consists of the plastic variable length intake manifold with variable induction system (VIS). There is also the Mazda’s Variable Air Duct (VAD) which operated as a second intake duct beyond 4,500 rpm. The L3-VE has sequential, multi-point electronic injection system and individual direct ignition coils. Exhaust gases go through the stainless steel exhaust manifold with heat-insulating layer and the catalytic converter. Mazda also produced the turbocharged version of this engine – the 2.3L DISI Turbo also known as the L3-VDT engine. The stock cartridge filter housings tend to leak. To help the longevity of that L3-VE / MZR 2.3L is to replace the oil filter housing with a spin-on unit housing. Otherwise, you'll run it empty. Use a quality filter and check your oil regularly. The L3-VE has the oil burning issue. Most cars with the oil burning problem are 2004-2005 production cars. There is no clear answer to the question what causes high oil consumption. But Mazda has made some changes in the last years of production which made 2.3L engines less prone to the oil burning. 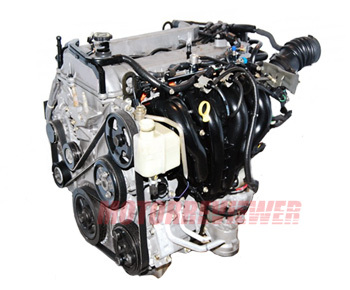 In the rest, the engine is quite reliable and durable. The longevity of the engine smoothly reaches 150,000 miles (250,000 km).